Swati Avashthi's YA novel Chasing Shadows strongly reminded me of a movie that I haven't seen in fifteen years but will never, ever forget: Peter Jackson's 1994 film Heavenly Creatures. Like Heavenly Creatures, Chasing Shadows is an engrossing portrait of the kind of intense, heady friendships that teenagers are capable of—friendships that can be deepened even further by adversity, transforming into something destructive and codependent. Chasing Shadows is told via alternating points of view, as two best friends, Holly and Savitri, struggle to recover from the death of Holly's twin (and Savitri's boyfriend) Corey. The three teens are enthusiastic devotees of free-running—a high-risk sport that involves using urban rooftops as a potentially deadly obstacle course. But when Corey is murdered by an unknown gunman, their self-sufficient, all-absorbing friendship is permanently shattered. Holly abandons herself to grief, while Savitri is left wondering where loyalty ends and facing reality begins. 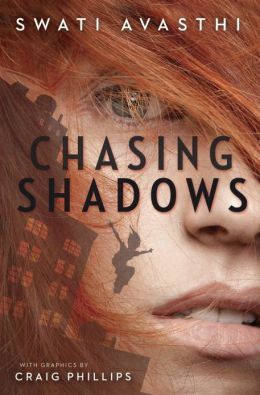 I spent most of the early chapters of Chasing Shadows distracted by adult-reader/real-world questions—like, what kind of parent lets their kids go prancing through dangerous neighborhoods, doing handstands on roof ledges? Am I supposed to find that kind of adrenaline-chasing appealing? If I had a child that took such senseless risks, they wouldn't need to worry about falling, because I would kill them myself. But once I managed to turn those thoughts off, Chasing Shadows became increasingly absorbing. The characters are well-developed, Avasthi's writing is stylish (but not obnoxiously so), and the book features several boldly illustrated sequences by artist Craig Phillips that seamlessly blend Holly and Savitri's love of comic books into the larger story. I suspect that teenagers are going to find Savitri's struggle to support Holly utterly compelling, while older readers will be able to appreciate (from a safe emotional distance) the author's portrait of the sincere but sometimes dangerously overwrought friendships of childhood.